Portability, performance and reliability are the hallmarks of Honda Marine’s new and redesigned portable engine models, the BF4, BF5 and BF6 4-stroke outboards. Honda Marine debuts new engines with the BF4 and BF6 models, and redesigns the legendary BF5 models. 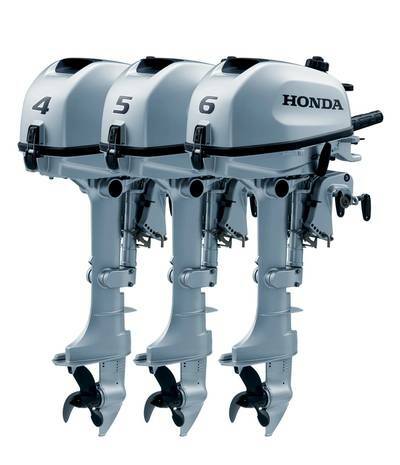 Packed with the latest technology from Honda, the 127cc 4-stroke, single cylinder engines offer boaters the choice of four horsepower (BF4), five horsepower (BF5) or six horsepower (BF6). All three new engines are available with either a short (15 inch/38 cm) or long (20 inch/51 cm) shaft. The new Honda Marine BF4, BF5 and BF6 engines provide consumers four main features—portability, performance, reliability and comfort. A combination of light weight (roughly 60 pounds) and new carrying handle design make the Honda BF4, BF5 and BF6 marine engines easy to transport and store. The tiller handle fully folds out of the way, making storage options even more convenient. The engines integrate a 1.5-liter, large capacity internal fuel tank which delivers the longest continuous running time in their class—more than 40 minutes at wide open throttle. In addition, the Honda BF5 and BF6 4-stroke engines can be connected to an external fuel tank for longer journeys. Consumers have the choice of an additional three different propeller options for the style that best fits their boating needs. Honda Marine’s new BF4, BF5 and BF6 models share the same, proven one-cylinder, 127 cubic centimeter engine block and benefit from Honda’s 4-stroke engine technology expertise. In case of an oil pressure drop, a new, low oil alert system will automatically limit the engine speed to 2,300 rpm, helping to protect the engine and providing boaters peace of mind. The new Honda BF4, BF5 and BF6 portable engines feature a host of new technologies and features that consumers will appreciate. The new Honda Marine BF4, BF5 and BF6 4-stroke engines deliver customers portability, performance, reliability, comfort and value. With a starting U.S. manufacturer’s suggested retail price (MSRP) of $1,875, the BF4 is a compact, lightweight engine with excellent low- to mid-range power. The new Honda BF5 delivers new features and technology at a starting price of $2,025. The starting U.S. MSRP of the new Honda Marine BF6 is $2,150.